Home » Can the Most Common Shipyard Injury Be Reduced? Can the Most Common Shipyard Injury Be Reduced? The Naval Sea System Command statistics show that overexertion, repetitive motion and other ergonomic injuries are the most common shipyard accidents. As this is the case, the U.S. Navy is looking into technology that could reduce these common injuries. The solution might be on-the-job exoskeletons. Currently, Special Operation forces use this technology. The Fortis exoskeletons will allow shipyard grinders and riveters to lift up to 36 pounds as if it weighed nothing. This could greatly reduce an injury that can slowly build up over time. Are There Current Standards to Prevent Ergonomic Injuries? Training employees to recognize such injuries and to know how to report them. Encourage potentially injured workers to report their injury early. Provide swift medical evaluation, care and follow ups, including rehabilitation services. Provide guidance on job modifications, restrictions and possibly alternative jobs for injured workers. In addition to injury prevention, following the above guidelines will help in the recovery process after an injury. If an employer fails to care for you after an injury or sends you on a task that aggravates a known injury, then you should seek the counsel of a maritime attorney. 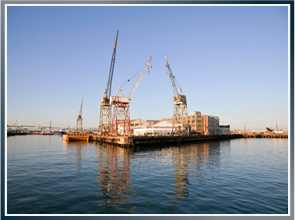 Where Can I Find a Shipyard Accident Attorney? If you have been injured on the job while working at a shipyard, then you may be eligible for compensation under the Longshore Act. Call our Latti & Anderson maritime trial lawyers today for a free confidential consultation. Previous Can Sandblasting Lead to Health and Safety Violations at a Shipyard? Next Were There Any Maritime Deaths in the Recent Hawaii Storm?